Do you text? I don’t, but there is no doubt that it’s fast and fun. More people text today than make phone calls. Can you believe that the number of text messages is expected to surpass 5.6 trillion by 2012? Yes, that’s with a T.
Be careful what you wish for. 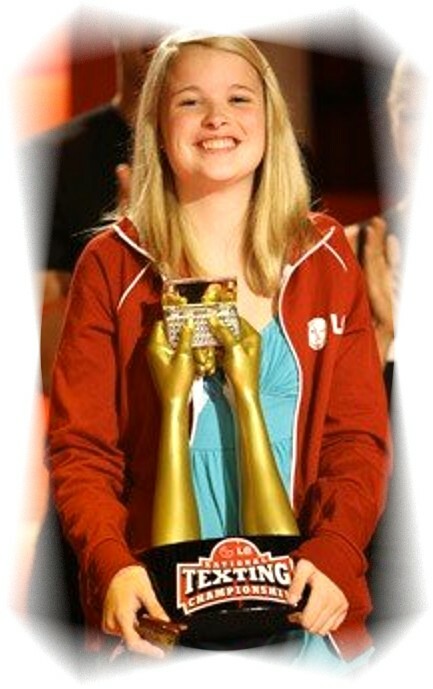 Remember Kate Moore, National Texting Champion? She had the glory of winning: had the trophy, the spotlight, the money, smart new phone… Kate also had to endure the heartache of being ridiculed by her peers, misquoted in newspapers, mocked on a well-known TV show and having her parents branded as “The World’s Worst Parents” on national television. One thing about Kate Moore: she truly is a champion … she’ll be back. I thought of someone else as I was writing this: Tiger Woods. Wasn’t it tracing a text message that got him into trouble? This entry was posted in Sports and tagged new world sport, texting. Bookmark the permalink.